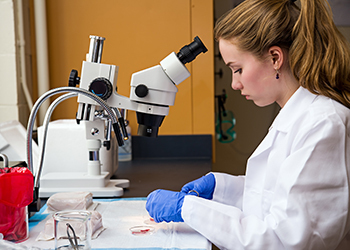 The Biomedical Sciences Summer Research Program is a ten-week summer research training program for undergraduates with interests in biomedical and health sciences research. The SRP began in 2003 and has grown to include faculty research laboratories in the Departments of Biomedical Sciences, Physical Therapy, Clinical Laboratory Science and Speech Pathology and Audiology in the College of Health Sciences at Marquette University. This is a unique opportunity for undergraduates to become immersed in an independent research experience and other enrichment activities under the guidance of a faculty mentor during the summer. The program is full-time (40 hr/week) and participants receive a $3,500 stipend for their participation. Student research projects span an array of biomedical and health issues. Please visit the SRP faculty mentor website for a list of participating faculty mentors and a brief description of their research interests. Current freshmen, sophomores, juniors and non-graduating seniors are eligible to apply. Seniors who will graduate before the start of the program are not eligible. Applicants are not limited to students from the Department of Biomedical Sciences or Marquette University. Qualified applicants from any department and/or university will be considered, provided sufficient background and interest in biomedical research is demonstrated. Underrepresented minorities are encouraged to apply. Applicants must be eligible to work in the United States and have the appropriate documentation. All wages are subject to federal income taxes. Students are expected to do full-time research as well as participate in all program activities. Due to the full time nature of the program, students are not permitted to take summer classes or hold any outside jobs during the 10 week program.